The ones who dropped the banner identify these automated shuttles as a new piece in a mosaic of projects designed to smooth the flow of people and capital within the metropolis. In other words, the city is designed to make sure that the only possible forms that life can take are that of producing or reproducing the capitalist, white supremacist, patriarchal reality. Although there are not yet plans to permanently deploy the shuttles locally, these tests give us a glimpse of the future form cities will take if no one intervenes. Most often, these projects are criticized for their role as harbingers of gentrification. And there is no doubt that these shuttles were never meant for the poor. However, we feel the need to expand our critiques. We aren’t opposed to these projects only because they cause displacement, but because they create a way of life we refuse to live. 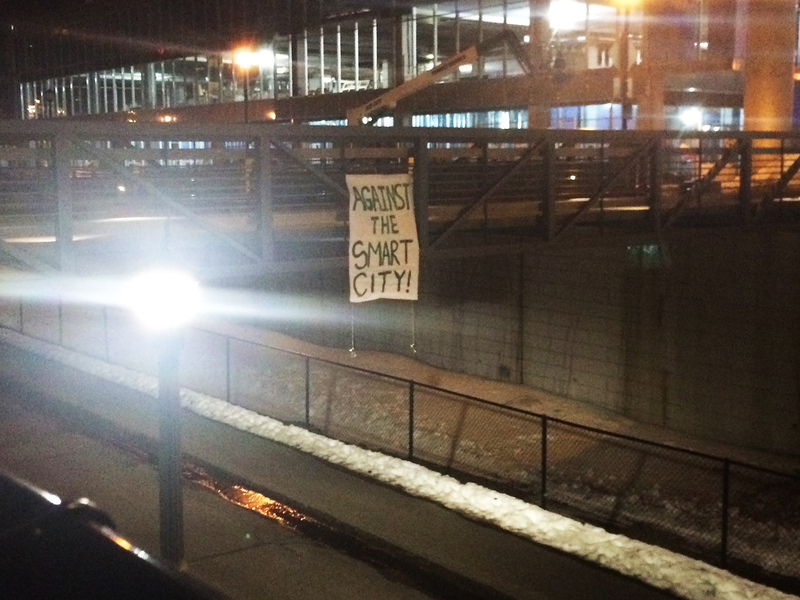 The automated shuttle was, of course, not the only thing tested during the Super Bowl. Local law enforcement began using FieldWatch, an app that allows police officers to stream video directly from their phones to the command center, at the time staffed by nearly one hundred people. Along with newly installed surveillance cameras, this gave law enforcement a real time view of virtually the entire downtown terrain. While the Super Bowl festivities have left, the police continue to take advantage of their new tools, and have even requested the installation of another thousand cameras. This “spontaneous order” occurs because the potential for disorder has been foreclosed on by the very structure of the city. Not only do these surveillance projects allow the police to track those they designate potential criminals, they psychologically impact our behaviors and encounters—this is the real panopticon effect. While disorder can never be completely eliminated, the smart city is designed for its maximum attenuation. And to put our cards on the table, we greatly prefer disorder over the world as it exists. How could we not? It’s clear to everyone that there is something deeply wrong with the state of affairs today. We are told that there are proper, legal channels through which reform will happen—but these channels are only yet another way to structure our possibilities.